Mix vinegar, oil, lemon juice, Worcestershire sauce, and spices for marinade. Pour marinade over pork cubes, place in sealable plastic bag, and refrigerate 4 to 24 hours, turning bag occasionally. 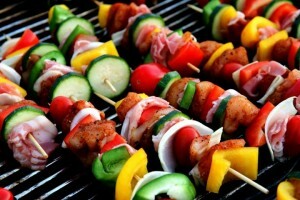 Remove meat from marinade and thread onto skewers. Grill over hot coals, basting with reserved marinade, for about 4 minutes on each side. 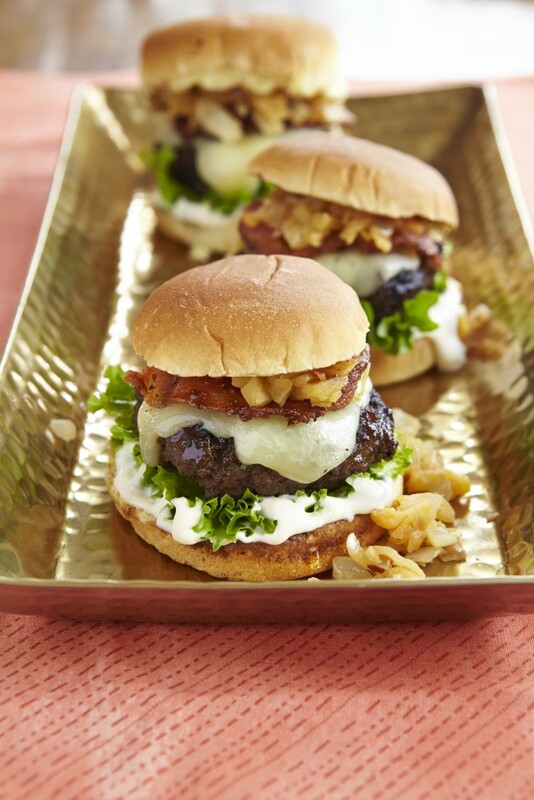 Serve by pulling meat off skewers onto slices of bread. Peel onion, cut a “circle” in the top, slice crosswise almost completely through. Place bouillon cube in the “circle”, and a half pat of butter between each crosscut. Wrap in aluminum foil tightly. Put on grill for 15 or 20 minutes. Serve individual onions in foil. Place all ingredients (except salt and pepper) in a large zip-lock plastic bag. Toss to coat well. Refrigerate 2 hours, or up to 3 days if you prefer. 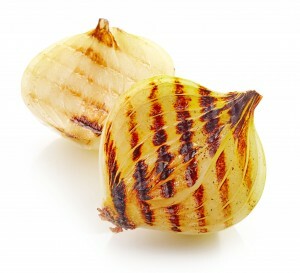 Prepare grill or broiler to medium-high. 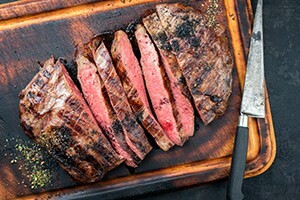 Remove steak from marinade and shake off excess. Grill or broil about 4 minutes per side (for medium rare). Preheat oven to 400°F. Line a rimmed baking sheet with aluminum foil. Preheat grill to medium-high. Arrange bacon in single layer on baking sheet. Cook in oven for 10 to 12 minutes, or until brown and crispy. For relish: In a skillet over medium heat, melt butter. Add apples and onions and cook for 5 to 10 minutes, or until tender. Add chili paste and salt. Remove from heat and cover to keep warm. For sliders: Break beef into clumps by hand and put into a bowl. Add parsley and salt. In another bowl, whisk together Worcestershire sauce, Balsamic Glaze, melted butter, brown sugar, and chili paste. Add to beef and gently mix to combine. Form into 12 patties. Cook on grill for 3 minutes. Turn over, top each with slice of cheddar, and cook for 3 minutes more. Transfer patties to a plate. Place rolls split side down on grill for 1 minute, or until lightly toasted. To assemble: Spread mayonnaise on bottom half of each roll. Arrange lettuce on top. Add patty, cheese side up. Halve each bacon slice. Put one half on each patty. Top with relish and remaining roll halves. 1. Before you get started, dust your grill grates with oil or cooking spray to keep food from sticking. Be sure to let the grates come to temperature before you begin cooking. 2. Bring ingredients to room temperature before you cook; they will then cook more evenly and quickly. 3. Remember the 4-by-4 rule to determine how hot your grill is: If you can keep your palm 4 inches over the coals for 4 seconds, it’s at medium heat. 4. For even browning of meat and poultry, pat the surface with a paper towel to remove moisture before grilling. 5. If your steaks curl on the grill, score the outer layer of fat at 1-inch intervals. 6. Refrain from pressing hamburger patties on the grill with a spatula or piercing meat with a fork; you’ll lose the juices. Use a spatula or tongs. 7. If you prefer skinless chicken, be sure to marinate the meat first; then baste frequently with leftover marinade during grilling. 8. Use fresh lemon juice in your marinades. It tenderizes meat, blends well with many flavors (from soy sauce and ginger to BBQ sauce), and accents other tastes. 9. Let meats rest at least 5 (if not 10) minutes before slicing them. The meat will absorb and redistribute the juices. 10. The best time to clean your grill is when the grates are still warm. With the back of a spatula, scrape anything on the grates into the fire, then use a wire brush to scrub the grates clean. Rolled Metal Products wishes all of you dads, and soon to be dads, a very special Father’s Day 2018! We welcome all orders and inquiries and will respond quickly with reliable service and lead times that meet your specific needs. Behind each of our sales representatives are skilled process technicians waiting to support your specific material requirements and processes. Independence Day 2018Happy Memorial Day from Rolled Metal Products!